8.5 star and a Gold Medal house! Strawbale Conference in Adelaide… we’re going, are you? 17-20 July Straw Bale Workshop HOT news. Our next strawbale workshop will be in the Mid Blue Mountains. For those who have some knowledge beforehand and want to put their skills into practise register quickly – as we booked out last time in 1.5 weeks! It costs $55 per person and your hard work for 4 days (no spectators) in exchange for learinng skills and getting experience. 19 & 21 June Sydney Homeshow, Sydney Showground, Sydney Olympic Park. We will be giving a couple of talks on the Thursday and Saturday on natural homes and why they’re so good compared to conventional homes. We’ve on from 12:30 so be there! 11-12 July Strawbale demonstrations at the ever popular Mudgee Small Farm Field Days. 4-7 October Natural Building Course at Kangaroo Valley, Sam will be teaching an intensive 4 day hands on workshop for anyone who is dreaming of building their own natural home with the folk from Milkwood. 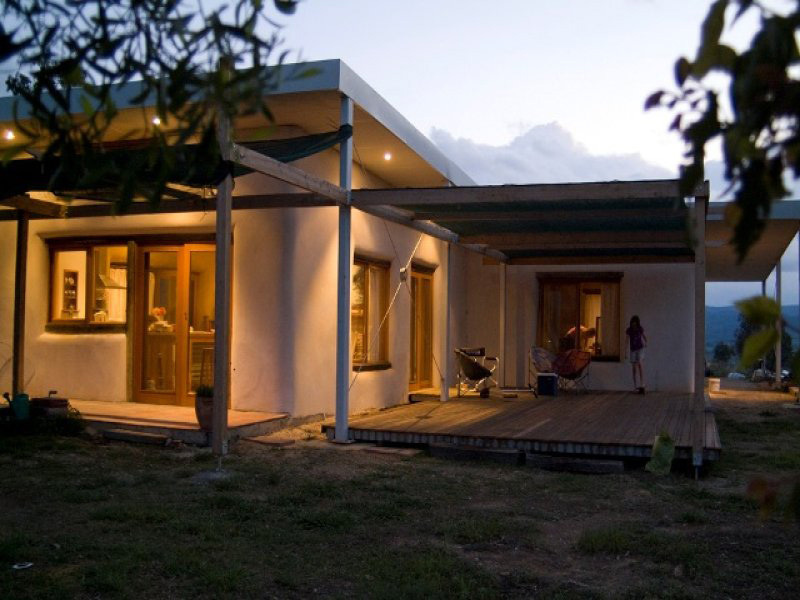 31 Oct – 2 Nov AREC Strawbale Building course at Mudgee. From fundamentals to advanced building techniques, this 3 day course is for owner builders, builders, engineers, tradies and strawbale junkies. For bookings and more info> The August course is booked out already (they may squeeze you on if you tell them we sent you). A two storey strawbale home we built in a cold climate zone just got rated 8.5 stars which is an incredible result. We’re still blown away by the efficiency of our homes. Of course these ratings are just the start and don’t take into consideration reduced carbon emissions and low carbon footprint or the fact that they are natural homes made from local materials (usually clay from the site)… but it’s a start (one day science and the government will catch up with what we’re about and how good they are for the world and us). Check out the photos of this house on flickr. We liked this building so much that we entered it in the Master Builder Association awards for sustainability – so keep your fingers crossed! Calling all clients! Please register your house for Sutainable House Day! This is a great opportunity to promote the benefits of eco-friendly living and sustainability. On Sunday 7 and 14 September, folk have the opportunity to tour an amazing array of everyday Australian homes all built and created around the ideal of reducing their footprint on the earth. By partaking in Sustainable House Day you can tap into local knowledge to learn how to successfully integrate renewable energy, recycling, and other sustainable practices into your home and lifestyle. We’ve just loaded some photos from our last straw bale workshop onto a flickr album: Please like, share, comment. Only heat the rooms you are in. Close all other doors which will help reduce your heating bills and energy use. Use draught stoppers on your windows and doors, and door sausages to stop draughts from coming into your home. Open the curtains in the morning to allow the sun to warm your home naturally, then draw the curtains as soon as the sun starts to lower to trap the heat in your home. Use ceiling fans (switch to winter setting) to push down heat in your home. Slow combustion heaters with a fan will help push the heat around your home. If it is a cold winter’s night and there hasn’t been any sun during the day, you may need to just warm the bedrooms. Panel heaters are by far the most energy efficient method and are good for your health (unlike non flued gas heaters). Oil and blow heaters are not efficient. Only turn on your solar hot water those days where there is no sun. If you heat up the cob internal walls, it will help regulate and keep the warm temperature in your home. Wear warm clothes and keep a pot of tatsty winter soup on the stove!